If travelers is less than 18 year old ( < 18) on departure date, please call 1-800-305-7638 for booking. 3. Infant less than 2 yeas old will be charged 200 USD without bed, seat and meal. Departure from home city to Shanghai, China. Make sure that you have all your travel documents prior to departure date. Enjoy your trip with Compass Holidays. 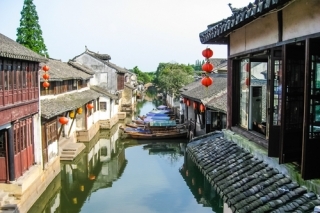 Suzhou is known as the Oriental Venice for its exquisite canals, bridges, pagodas, and beautiful gardens. After breakfast, enjoy a visit to the UNESCO World Heritage Site, the Lingering Garden, a classic private garden with 500 years of history. Afterwards, continue our journey to the Suzhou Silk Factory—the largest silk factory in the country, to discover the mysterious producing of silk. You will have the opportunity to taste the famous local dish "Hong Shao Paigu", which is Wuxi style pork ribs, cooked in a red style, topping a sauce of rice wine and soya sauce flavored with ginger, cloves, anise and black pepper. 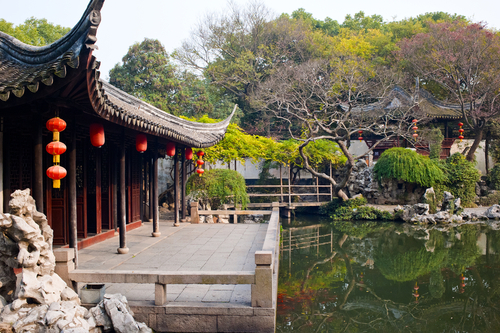 In late afternoon, enjoy a visit to the Li Garden, which lies on the bank of Li Lake, covering an area of 8.2 hectares. It is also one of the main beautiful attractions of Tai Lake, a key scenic area of China. Today, we will make our way from Wuxi to Hangzhou. On the way to Hangzhou we will pass by and chill at the fresh Water Pearl Farm. 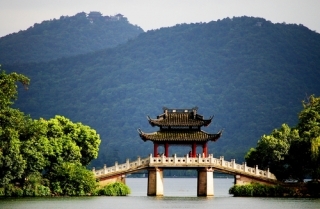 Hangzhou is described by Marco Polo as "the most beautiful and magnificent city in the world". Enjoy Dongpo Pork which is slowly cooked by braising fine-skinned and thin pieces of fat streaky bacon with famous Shaoxing wine in a sealed pot. When the dish is ready, the bacon will be moist and red, and the sauce will be thick and tasty. It tastes savory, sweet and tender, but not greasy. A. Impression West Lake ($79/person from Feb- Oct). This large-scale scenic on-water performance is produced by famous film director Yimou Zhang. It is one of the best shows in China, so we highly recommend it! B. You can also choose to watch West Lake Night Show ($65/Person all seasons). After breakfast, enjoy a visit to a cultural and natural heritage site in Hangzhou, West Lake, which is one of the top "can't miss" sites in China. Wonder around and take some photos. West Lake is a great destination for leisure. 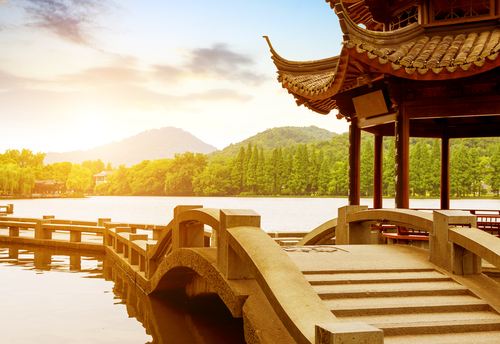 West lake is the most renowned feature and the centre of Hangzhou, noted for its scenic beauty which blends naturally with many famous historical and cultural sites. Take a boat ride to see the lake and the city from a different angle. For lunch, you will have the opportunity to taste the authentic local "Xiao Long Bao" (steamed buns). After lunch, visit the No.1 tea plantation and taste the well-known Dragon Well Tea, which is acknowledged as the best green tea in China, and the best among all the green teas in the world. Afterwards, the bus driver will drive us to Shanghai. 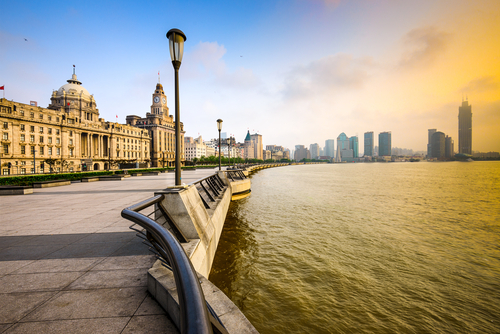 Walk along the famous Bund, lined by the colonial architecture of European design built in early 1900s. This area is the best place to capture the Western influence on Shanghai’s architecture and urban space in the old days. It is now the called "Wall Street of the East". 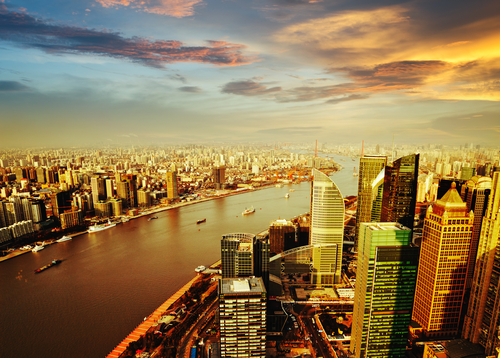 Huangpu river runs across Shanghai, dividing the new and old parts of the city. You can get a glimpse of the dazzling and charming night view of Shanghai from the boat. In the morning, visit the Shanghai Museum to see ancient Chinese art, furniture and jade, followed by a visit to an Emerald exhibition center. Then visit the City God Temple Bazaar where you can find many specialty stores selling traditional Chinese arts and crafts, medicine and souvenirs. In the evening, enjoy a farewell dinner in Shanghai style, called "Hu" cuisine, also known as "Benbang Cai". Arrive at Bangkok Suvarnabhumi airport where you will be met and greeted by your Asia World guide, waiting for you at the exit gate with a signboard. You will be transferred to your hotel for check-in. The rest of the day will be free: you can enjoy the facilities of your hotel, explore the surroundings or rest at leisure. markets, magnificent temples and palaces, offering something to everyone. After breakfast, enjoy a fun ride on a speed boat to Coral Island. There is a variety of optional water sport available for your enjoyment. After then a special seafood lunch on the island. Afternoon proceed to Nong Nooch village, with show of elephant, Thai Cultural show (Songkarn & Loy Kratong) Performances. After then visit the Four Region Floating Market, where you can buy fresh exotic fruits. After breakfast you will visit the Jewelry & Lather exhibition Centre. Then you will visit Chang Siam, ride Elephant, (Fruit buffet) and local specialty store. Then transfer back to Bangkok and enjoy Vanessa Cabaret show. After breakfast. Visit National snake research center in the snake park you can watch the cobras, and other performances, but also to see the world’s most powerful, the most poisonous king cobra. Lunch will be served at highest tower in Bangkok, the Baiyoke Sky located on the 78th floor, with an amazing panoramic view of the city. After lunch visit King Power duty-free shopping Mall is Bangkok’s largest and most stylish international chain of duty-free shopping mall. Afternoon, visit to the Experience life in a new dimension at an art gallery like no other! These unconventional paintings use an art technique where two-dimensional pictures are turned into three-dimensional images through the use of optical illusions. There are five zones within the museum: Aqua and Safari, Classic Art, Fantasy, Nature and Modern Art. Evening enjoy shopping at ASIATIQUE, The Riverfront is the largest waterfront themed retail and new lifestyle night shopping place in Bangkok. Free at leisure until the departure time, then transfer to Suvarnabhumi Airport for departure flight. The Grand Canal is the world's longest human-made waterway, being 1,800 kilometers long. The canal connects the present cities of Beijing in the north and Hangzhou in the south. 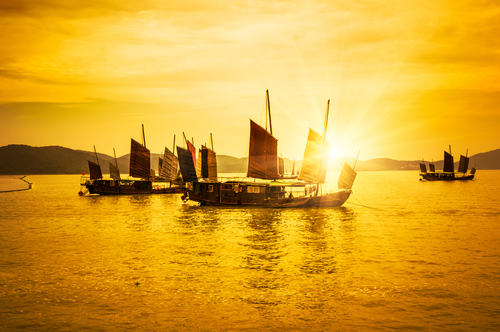 Since most of China's major rivers flow from west to east, the fact that the Grand Canal runs north and south provides it as an important connector between the Yangtze River valley and the Yellow River valley. 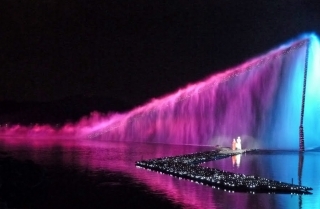 Impression West Lake is a spectacle of light, music, dance and theatrics. The stories are based on Hangzhou legends. Using the lake and its surroundings as props, lights and hundreds of actors create a sensational performance. This performance reflecting the long and splendid culture of the region. 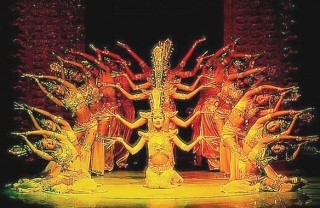 Songs, dances, opera, acrobatics and stunts are integrated in this performance to present Hangzhou's rich ancient civilization and remarkable customs. The performance consists of five scenes lasting around 1 hour in total. The most renowned feature of Hangzhou, noted for its scenic beauty which blends naturally with many famous historical and cultural sites. Cruising along the Huangpu River, you will take a glimpse of the history and charming night view of the cosmopolitan of Shanghai. On one side of the river, there is the Bund, a landmark of Shanghai, with buildings of Western style dating back to the early 19th century. 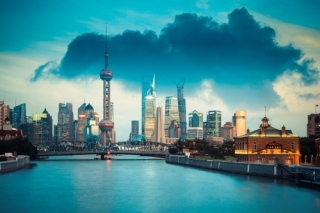 On the other side is the image of a new Shanghai with steel and glass skyscrapers. This multi-million dollar show is Shanghai's most popular acrobatic show, featuring the gamut of traditional and contemporary Chinese acrobatics from aerial walking, bowl balancing, and trampoline shows to high flying trapeze acts and motorcycle cage stunts. 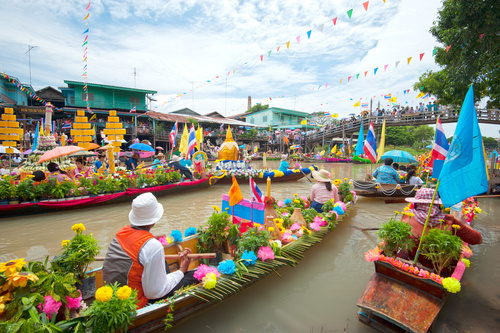 Early morning pick-up from your hotel in Bangkok (within the city) and depart for Damnoen Saduak Floating Market. There, you will see traditional Thai lifestyle that reflects Thailand’s history. Continue to Kanchanaburi Province to visit the Allied War Cemetery and JEATH War Museum (i.e. a replication of a prisoner of War Camp containing photographic memorabilia). Board a train and take a ride along the Death Railway on the original wooden viaducts. After lunch at a local restaurant, head down to an elephant camp for a ride on the elephants (2 pax per elephant on a saddle), followed by a gentle sail over the Kwai Noi River on a bamboo raft. Proceed to the hotel at Home Phutoey River Kwai Resort. After breakfast, visit the Hellfire Pass Memorial, a part of the Death Railway that was built out of the rock using forced labour during World War II. Nowadays there are no trains running on this stretch of the line; but visitors can walk along it and visit the museum dedicated to all Allied prisoners of war and Asian labourers who suffered in the Asian Pacific region during World War II. Continue to Ayutthaya via Suphan Buri: you will surely notice the stunning sceneries near the Burmese border; it is dominated by fertile farmland and jungle-clad mountains. En route, enjoy lunch at a local restaurant. Arrive in Ayutthaya where the rest of the day is at leisure for exploring. After breakfast, head to some of the most famous temples in Ayutthaya, such as Wat Srisanpetch, Wat Yai Chai Mongkol, and Wat Chai Watthanaram; some of which are among the most beautiful in the area. Proceed to Bang Pa In, the former summer residence of the kings of Ayutthaya built in the 18th century. The Royal Palace lies amidst beautiful and extensive park grounds, in an exotic combination of Thai and European architecture. The Thai pavilion was built in the middle of a lake and will certainly catch ones’ eye while the Chinese-style palace Vihat Chamrun will impress sightseers by its grandeur. Board on a beautiful cruise for lunch and enjoy a relaxing cruise down the fabled Chao Phraya River to Bangkok. 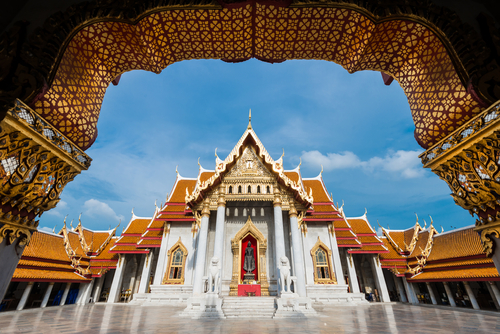 Upon arrival in Bangkok, you be transferred back to your next destination. Once checked-in, the rest of the day will be free: you can enjoy the facilities of your hotel, explore the surroundings or rest at leisure. Visit the most sacred temple in the north of Thailand; the Wat Prathat Doi Suthep is the most sacred temple in Chiang Mai containing a holy relic of the Lord Buddha. Tucked away in the mountains at an elevation of 1,056 meters (3520 feet), the temple is reached using a Naga (7- headed dragon head serpent) railing rising along both sides. 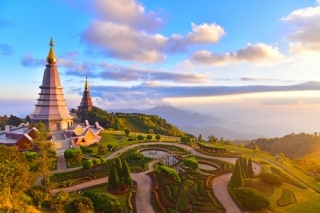 The temple compound – reachable via a 300 steps stairs offers an exhilarating view of Chiang Mai city and surrounding countryside. Drive back down to the city centre to visit some of the other impressive temples of Chiang Mai. Wat Suan Dok is one of them, which dates back to the 14th century when it served as the pleasure gardens to the Thai monarchy. Nowadays it houses several white Chedi’s, containing the ashes of Chiang Mai’s former Royal family. This temple also houses one of the most famous Monk Schools in the whole of Chiang Mai and the Wat Jedyod, also known as The Temple of Seven Spires. Spend the rest of the day at leisure. 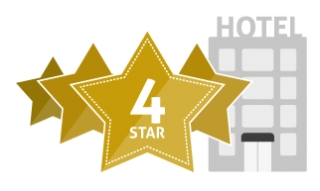 Upgrade to 4 stars accommodation when you travel in Chiang Ma for 2 nights. 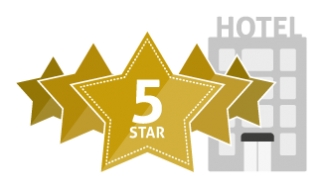 Upgrade to 5 stars accommodation when you travel in Chiang Ma for 2 nights. Arrive at Phuket International airport where you will be met and greeted before transferring to your hotel in Phuket. 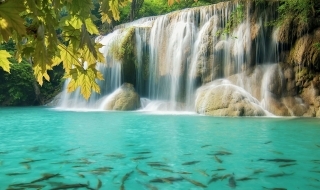 Phuket, well known as the “Pearl of the Andaman”, offers a wide range of activities. With deep-sea diving, high-end dining and white beaches all within reach, it really is hard to say farewell! This orientation tour is designed to give visitors to Phuket a nice introduction to the island without forcing them to invest in a full-blown excursion. The trip features a road tour that passes by Phuket’s most famous beaches; a visit to the acclaimed Chalong Temple; a short outing from out of Phuket Town, famed for its Portuguese architecture. We also provide you with a chance to see the most famous lookout point on the island - Promthep Cape. Additionally, guests who like to shop will not be disappointed as stops at local gemstone and cashew nut factories are also on the agenda. Phuket remains an outstanding holiday destination, not only due to its large variety of beaches, but also due to its cultural importance in southern Thailand. 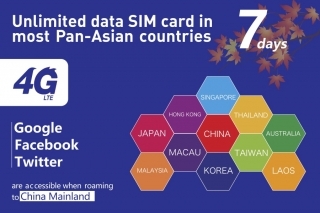 *Facebook, Google, Twitter and other non-Chinese websites are accessible when roaming to China mainland. *Can be used in an Apple iPad/ Tablets, Mobile Dongles and Mobile Phones. Phones must be unlocked before use this sim card. *Cards offer 200MB/day on 4G/3G network and unlimited data on 64 Kbps network. *Please note this sim card can't be used to call. Internet Data only. 2) Local 3-5* Hotel Accommodation or similar. *If you travel alone and want to avoid single sup, you can use "Find Buddy"on our website. Air-inclusive tour package 100% NON-Refundable, NON-Transferable. Customers are responsible for obtaining and paying for all visas and entry documents, for meeting all health and other requirements and for any documents required by the laws, regulations, orders and/or requirements of the countries you will visit and for your return home. Canadian citizens can contact Foreign Affairs Canada at www.travel.gc.ca. Citizens of other countries should check with the relative Tourist Board or Consular office of the destination which they are intending to visit.Visa and entry documents must be obtained independently prior to departure. Compass Holidays will assume no responsibility whatever for passengers denied carriage by the airline or refused entry into any country. Non-Chinese(Canadian/USA/British travelers) must present a passport to visit China, which must be valid for at least six months beyond the date of expected departure from that country. Official (special and diplomatic) passport holders must consult us, as you may be subject to different entry requirements. Non-Chinese(Canadian/USA/British travellers) must also be required a valid Chinese visa. Compass Holidays will only provide assistant for shopping on tour, however, Compass Holidays will not be responsible for the price or quality issue of your purchasing on tour. Please keep in mind that Compass Holidays may not be able to assist you for seating due to the policy of certain airline companies. After you booking the tour online, you will have have 24 hours to fill out all the passengers’ information, otherwise Compass Holidays may change the price. Please double check the information in your booking process. $100 service fee plus additional fee will be charged for change the booking information including name correction , optional tour change or cancel. 2. This is a shopping tour required to make several stops of one to two hours as outlined in the itinerary, but you aren't obligated to purchase. Skipping scheduled are not allowed and will be considered as breach of tour booking contract, USD100/per day penalty will be charge for leaving the group. Also the remaining tours, hotels and flights will be cancelled by without any further notice. 3. We strongly recommend you join our experts optional tours, because most of our group hotels may far away from the sightseeing place and downtown area, so if you do not join optional program, you might need wait in the bus or find your own way to catch the group to the next destination. Be aware that most of the major attraction sites always have long line up for ticketing and some of them have limited inventory and flow control, make sure join our tours to save your time and enjoy the group rate. 4. Single supplement should be apply for single traveler, and if the companion cancels or no show or interrupts the tour. 5 . The tour fee excluded Optional tour Fee listed on the itinerary and Compulsory Tips. All tour extensions requires a minimum of 10 participants to commence. Compass Holidays reserve the rights to cancel the tour extension without prior notice. 8. The tour does not include additional costs when unforeseen or unavoidable circumstances or events arising. Unforeseen or unavoidable circumstances or events including private demand, flight delays / cancellations, the threat of war / potential threat of war, riot, civil strife, terrorism / actual terrorist activities, natural disasters, adverse weather conditions, etc. .
9. Please double confirm 24 hours prior to departure for your flights statues, the first night hotel and tour guide information to avoid any mistake. 11. In case of delayed or canceled flights and other causes of delays or changes , please contact your travel agent or the local emergency contacts as soon as possible, any tickets and transportation costs incurred loss, please be borne by the guests. 12. For any tours involving an altitude of 3000 m and above, seniors and those who suffer from hypertension, cardiovascular diseases, pulmonary diseases and other related health issues must decide on their own if their health is fit for the tours prior to booking. Once booked, we would assume that guests and families were aware of any associated risks. Should guests experience any health problems on the trip, guests and families need to bear all the responsibilities and costs. 13. Every client is only allowed to bring one luggage on board (Weight below 23 kg, the sum of three sizes must not exceed 158 cm ). If client bring more than one luggage (if the coach has enough space) , we will have to charge 5 USD everyday for each additional luggage. Apologies for any inconveniences caused. 14. Chinese tours are different from other countries. Some attractions cannot be reached by the coach so clients will have to walk. If the passengers are with reduced mobility , they cannot visit these attractions. Clients could not use the loss of attractions as an excuse for refund. They could not use the loss of attractions as an excuse for refund. Please think carefully before applying our tours. Once applied, it is equivalent to accepting our terms and conditions. 15. For the laborious and attentive work of driver and tour guide, the company requires the clients to give them 10 USD (minimum) per person per day as gratuities. 16. Please present the voucher when get in the tour bus. The Company is not liable for any delay or expenses incurred due to passenger’s negligence to arrive at the airport or meeting Points on time. Call the emergency number if have any accident. 17. Passengers must have a valid passport and visa. The Company will not be held responsible for any expenses if passenger is refused entry by any countries. 18. Passengers shall be regarded as carrying his/her own risk with respect to loss or injury to person or property. The company is not liable for any loss which may arise during the tour. 19. Please bring enough cash to pay the self-paying optional tours and meals according to the list. 20. Please bring carsick medicine, essential balm and other personal use medicine. 21. Don't bring any contraband goods or smuggling articles according to the law of local country. 22. Non-refundable for any unused portion of the tour and any meals listed in itinerary after departure whatever the reason is that you cannot continue with the tour. The Company is not liable if passenger decide to withdraw during the tour. 23. The Company also reserves the right to require any individual to withdraw from the tour if deemed his/her act of conduct is detrimental to or incompatible with the interest, harmony & welfare of other passengers and the tour as a whole. The Company shall be under no further liability thereafter to any such person. 24. The Company will accept no responsibilities for losses or additional expense due to accident, delay, weather, strike or cause beyond its control. The Company is not liable if passenger decide to withdraw during the tour. 25. The Company reserves the right to alter or curtail the itinerary substitute hotels and/or conveyances as it is deemed necessary. 26. The Company acts only as an agent and/or intermediary for independent suppliers. As a result it retains other contractors to provide transportation, accommodation and other related travel services. The Company accepts no responsibility for any such losses or any additional expenses or and distress due to delays, sickness, weather, strikes or any other causes. All passengers are STRONGLY URGED to take our adequate insurance coverage to protect yourselves against cancellation due to illness prior to or during the travel. Please advise the agent staff or tour guide once the passengers get acute symptoms. We will provide help and send the passengers to the local hospital. All the medical and hospital cost will be charge by the passenger. We received the rights to charge the USD100/per day penalty and suggest the passengers go to the hospital when the passengers get sick and the symptom may affect the other travelers. We don’t recommend the passengers who has visual or hearing impairment, Serious mental or physical illness, or the passengers with heart, lung, brain and blood disorders which might affect the health through long-distance travel, or the passengers who is more than 75 years old, or who is being pregnant. Please advise doctors before purchase the tour product. Passengers have fully understand and accept the terms and conditions once you purchase the tour. Our travel agent will not be responsible for any illness which is caused through passengers’ own disabilities or health condition. This document creates a contractual relationship between Compass Holidays/Vacances Compass Holidays Inc./Tian Bao Travel (hereafter “Compass Holidays”) andyou, the customer/participants who purchased any travel services from Compass Holidays.Please read the following carefully in their entirety and it is important tounderstand these terms and conditions applying to any travel arrangementsprovided by Compass Holidays. To reserve a trip with Compass Holidays andsigning our agreement and authorization form indicates acceptance of, and youragreement to follow terms and conditions hereunder. Prices shown herein are calculated in US funds and Canadian prices wereconverted from US based on Bank of Canada’s exchange rate as of Dec 23, 2015.All prices are on a per person basis for double occupancy accommodationincluding the current taxes & V.A.T of each destination. All prices aredependent on fuel costs, applicable V.A.T and local taxes, rates of currencyexchange and other variable factors and are subject to change at any timeshould major circumstances and currency fluctuates. We reserve the right toincrease the price of any product should these costs increase. 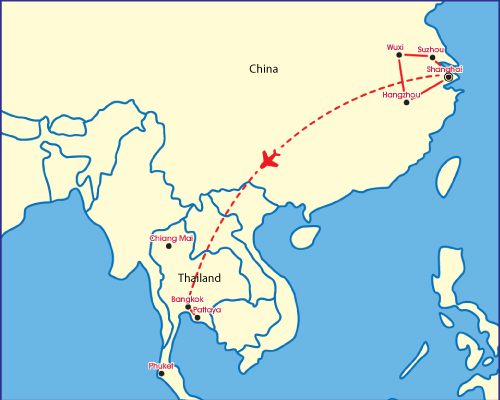 The intra tour airfares are normally included (unless specified). Themiscellaneous surcharges such as airport taxes, airline fuel surcharges areexcluded. The international airfares are additional and we will quote it separately atthe time of booking. Prices exclude any expenses of personal nature, meals not mentioned in theitinerary, gratuity, travel insurance, cost of obtaining passport or visas,etc. Children 12 years of age or above at time of travel will be charged adult rate.Child rate may apply for children younger than 12 and proof of age is requiredat the time of booking and can only apply when a child is accompanied by twopaying adults. Child rates vary from airline to airline and hotel to hotel, andnormally between 15% and 20% discount of the adult rate, provided they sharethe same room with two adults with an extra bed. Otherwise the full adult fareapplies. Compass Holidays offers accommodation at the hotels stated in the programsincluding daily breakfast (if indicated), service charges and taxes. We reservethe rights to substitute the hotels with same category when necessary. Specificbed types should be requested at time of booking and cannot be guaranteed.Single supplement is chargeable to individual traveler who wishes to secure aprivate room on a trip. Specific meal must be requested in advance and cannotbe guaranteed. Sightseeing tour is conducted with English-speaking guide (guide speaks otherlanguages available upon request, surcharges may apply) as shown in theitinerary, including entrance fees for places visited. Air-conditioned vehiclesare utilized when available. The sequence of the itinerary may change. You must consult with your travel agent or the specific airlines on which youare travelling for the dimensions and weight restrictions. However, since mostof the intra tour flights operated by regional carriers have a baggagerestriction of only 1 piece; 44 lbs per person, therefore, we highly recommend1 piece of checked luggage and 1 soft carry-on baggage per person. Baggage andpersonal effects are at owners risk throughout the tour. To reserve a trip, we require a non-refundable deposit of CAD or USD $300 perperson plus the applicable insurance premium. If you have selected instantpurchase, non-refundable air, you are required to pay the full air cost inaddition to the $300 deposit at time of booking (all of which is non-refundable). For bookings of luxury rail journey or cruises, deposit amountwill be advised at the time of booking. We reserve the right to request additional deposit for any booking if requiredby hotels and ground suppliers, especially for peak season such as (but notlimited to) Christmas, New Year and Chinese New Year, Easter and Thanksgiving. The balance of payment is due 60 days prior to departure (except the bookingsof luxury train and cruise journeys which will be advised on the invoice). Anybooking made within 60 days of departure is payable in full at time ofconfirmation. To confirm the reservation, traveler or their representative mustprovide us with complete mandatory information of traveler, sign and return therelevant documents not more than 3 days after receipt. Cheque and Visa,MasterCard and American Express are accepted and charges will be on TIAN BAOTRAVEL or Airlines merchants for air tickets. Your authorization to use your credit card to pay for travel services providedby Compass Holidays indicates your acceptance of and compliance with ourbooking Terms & Conditions, whether or not you have actually signed theappropriate credit card slip. Verbal authorization for the use of a credit cardconfirms the reservation and simultaneously you are also acknowledging youracceptance of our Terms and Conditions. Therefore, by providing your TravelAgent or Compass Holidays with authorization to use your credit card to pay fortravel services you are confirming that you will pay the total amount chargedfor those services to the card issuer according to your cardholder agreement.Traveler is to be responsible for the credit card merchant fee charge of 5% ofthe total charge on the credit card at the time of reservation. Compass Holidays reserves the right to cancel, reschedule or amend anyitinerary in accordance with operating requirements or circumstances beyond itscontrol or if the quality of the trip or the safety of travelers is judged tobe compromised. In such a case, refund of payments received by Compass Holidaysshall constitute full settlement. Compass Holidays is not responsible for any other travel arrangement affecteddue to our cancellations. Where amendments beyond our control require us to addor amend a service(s) resulting in an increased cost, a surcharge may be payableby you for the additional or amended service(s). Compass Holidays cannot assume responsibility for any loss incurred on accountof non-refundable air tickets. Prior to 60 days of your original departure date, you have a sole opportunityto switch to a difference trip in the same calendar year upon payment of a feeof $ 100 per person. Within 60 days of departure, no change can be made and thecancellation fees will apply. A revision fee of $50 per person applicable forany alternation or revision made to a confirmed booking. Compass Holidays makes every effort to ensure the accuracy of the informationcontained herein and to the best of its knowledge all information is accurateat the time of publication. We attempt to ensure that the prices in thebrochure and on the website are accurate, however errors do occur and wereserve the right to refuse to accept bookings at any price published in error. In addition, Compass Holidays reserves the rights to change the itinerary whennecessary for reasons beyond our control and provided the travel facilities orother services are of at least the same standard or value. We stronglyrecommend that you visit our website www.compassholidays.net for most updates. You are responsible for obtaining and paying for all visas and entry documents,for meeting all health and other requirements, and for any documents requiredby the laws, regulations, orders, and/or requirements of the countries you willvisit and for your return home. Canadian citizens can contact Foreign AffairsCanada at www.travel.gc.ca and Americancitizens can contact the Department of State at http://travel.state.gov for assistance inobtaining this information. Citizens of other countries should check with therelative Tourist Board or Consular Office of the destination which they areintending to visit. Visa and entry documents must be obtained independentlyprior to departure. Compass Holidays will assume no responsibility whatsoeverfor passenger(s) denied carriage by the airline or refused entry into anycountry. Compass Holidays strongly recommends that you carry a valid passport whentravelling outside of your home country. Please note that most countries nowrequire that your passport be valid for up to six months after the completionof your travel in order to be accepted by them as a valid travel document.Compass Holidays cannot accept liability for any passenger refused entry ontoany transport or into any country due to failure of the passenger to carrycorrect documentation. Some ground operator in foreign countries require Compass Holidays to collectand pass on certain personal and other details related to you, including butnot limited to government-issued identification and passport details in orderto confirm your transportation or accommodation. If you fail to supply thedetails as requested fully and accurately, your trip may be interrupted orcancelled. There are no refunds for failure to provide documentation or failureto provide documentation by the time required. Compass Holidays strongly recommends that all travelers review and purchaseyour trip cancellation and health insurance to ensure you have coverageappropriate to meet your needs when confirming on a trip, in case of anycancellation penalty, loss of property, or liability of medical treatmentduring the trip. Please consult your travel agent or Compass Holidays forpremium. If we do not receive payment for the insurance at the time of yourdeposit, it will be assumed that you have declined coverage. By sending a deposit toward your trip purchase and completing travelerinformation form, you certify that you do not have any physical condition ordisability that would create a hazard for you or other travelers and you havereceived all appropriate vaccinations. Please consult travel clinic or your doctor. Traveler needs special assistance due to physical condition must be brought upto the attention of Compass Holidays in writing at the time of booking. We promise to make sure that all travel arrangements we have agreed to make,perform or provide, as applicable, as part of our contract with you are made,performed or provided with reasonable skill and care. Your purchase of travelservices provided by Compass Holidays is based on travelers agreeing to thisLimitation of Liability. i) Any negligent act or omission by the airlines, transportation companies,coach tour operators, car rental organizations, hotel/resort properties orother suppliers or their personnel or any company or person not under ourdirect control. Ii) Government actions, political issues, weather, equipment failure, labourdisputes, sickness, theft or any other cause beyond our direct control. Iii) Failure of the passenger to obtain the necessary documentation or meet therequired health regulations in order to complete their travel arrangements. Iv) Failure of the passenger to arrive at the airport by specific airline’sCheck-in Deadlines on the day of departure whether due to missed connections,adverse weather conditions, mechanical failures or any other reason whatsoever. V) The need for us to change itineraries or substitute accommodation orservices, provided that every effort is made to supply the most comparableservices and accommodations available. Vi) Cancellation of trip arrangements made by Compass Holidays, provide allmonies paid by travellers are fully refunded back to travellers. Vii) While every effort has been undertaken to ensure accuracy, photographs,artist rendering and written descriptions in this brochure are representationalonly and are not a guarantee that everything will be exactly same as at the destinations. Compass Holidays and / or its agents, act only as agent for travelers in allmatters pertaining to the trips, we shall not be liable for any claims, losses,damages, costs, expenses, delays or loss of enjoyment, of any nature or kindwhatsoever, resulting from events beyond our or a supplier’s reasonablecontrol, including but not limited to acts of God, strikes, lockouts or otherlabour disputes or disruptions, wars, blockades, insurrections, riots,earthquakes, weather conditions, floods or acts or restraints imposed bygovernment authorities. Compass Holidays shall be excused; discharged orreleased from its performance to the extent such performance is so limited orprevented, without liability of any kind. Travelers agree that Compass Holidays is the trustee of the respective rightsunder this Limitation of Liability, which will apply to a traveler’s trips withCompass Holidays, and any transfer of a reservation to another trip, includingany deviations or extensions. This Limitation of Liability is binding upon allmembers of the traveler’s family, dependents, estate, heirs, successors andlegal personal representatives. Any claim or dispute arising out of or relatingto this Limitation of Liability or its interpretation, the trip, or thetraveler’s relationship with Compass Holidays will be resolved exclusively inthe courts of the Province of Canada in which the particular office of CompassHolidays is located and with which traveler had contracted their trip and willbe governed exclusively by laws of that province of Canada. Except for verifiable extenuating circumstances, there are no refunds,whatsoever, for any unused travel arrangements and services including but notlimited to accommodations, meals, intra tour transportation or sightseeing. Anyrefunds for unused travel arrangements and services shall be issuedin the solediscretion of Compass Holidays. Any adjustment considered will be based on theactual cost of the service involved and not on a per diem basis. All claims must be made in writing to your travel agent and accompanied byreceipts, reports and other documents pertaining to the claim and must bereceived by Compass Holidays for investigation no later than 14 days after yourreturn from your trip. We will not consider any request for refund received byit after 30 days of tour termination. NOTE: Please carefully examine this invoice. It will be considered correct ifno disputed item is reported on or before 7 days from the receipt of thisinvoice. Remittance must be made by its due date and the interest will becharged on unpaid overdue amount. When making payment please quote our file andinvoice numbers. Official receipt will only be issued upon request.